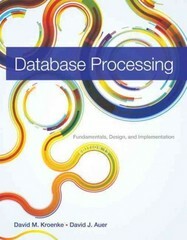 Database Processing 13 Edition Get students straight to the point of database processing. Database Processing reflects a new teaching method that gets students straight to the point with its thorough and modern presentation of database processing fundamentals. The thirteenth edition has been thoroughly updated to reflect the latest software.